We are Aikido club training in gym of ZŠ Jeseniova on Žižkov. Aikido is suited for everyone (women and men of all ages) – don’t hesitate to come and try Aikido out for yourself. What is interesting about training with us? In our club the contemporary Aikido techniques are studied together with their history. History of techniques can be surprising well documented in historical sources (for example wood prints) and it shows their original substance. Consequently, training with weapons is more ofter in our Dojo. Changes of training times are published in other section. The closest tram statin is station Biskupcova. 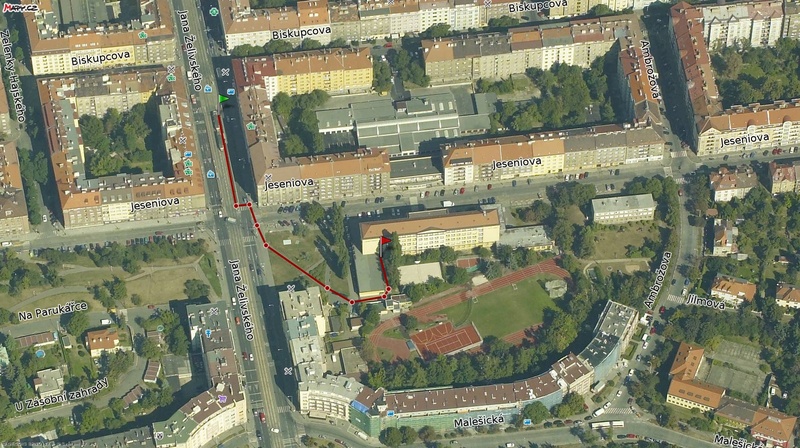 The areal of ZŠ Jeseniova (in Prague, Žižkov) lies South to Biskupcova tram station (see the picture below). Enter the areal by side entrance (green gate with bars) and turn left. Then enter the building through the glass door and continue down stairs into basement. On your left are doors with doorbells. Use the bell with name “Malá tělocvična” (means small gym) and we will come to the door for you. Here is highlighed the way form tram stop Biskupcova to our Dojo. We can make arrangement to pick you up on tram stop Biskupcova (or somewhere else for that matter).